Here is another CIT result of a patient who is 17 months post-op. 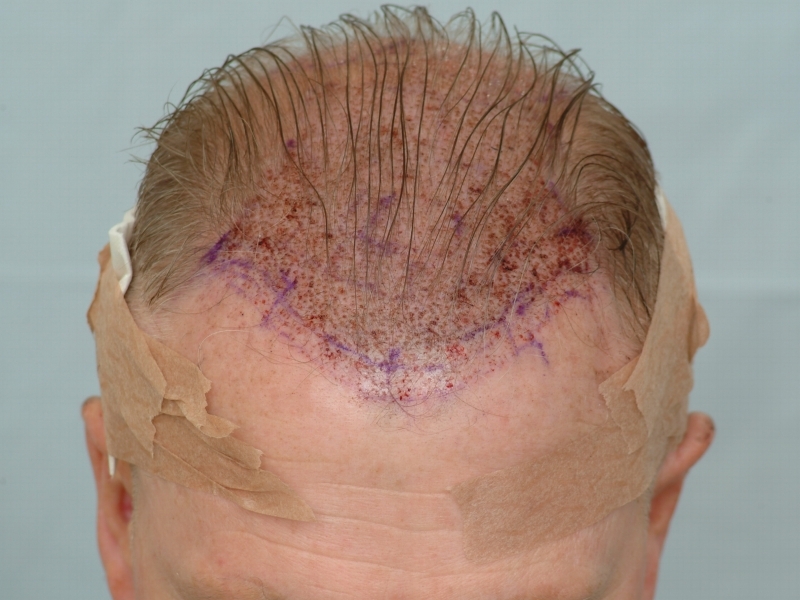 This Norwood 3V patient pursued our clinic in hopes of increasing density in the frontal scalp and reinforcing the top. 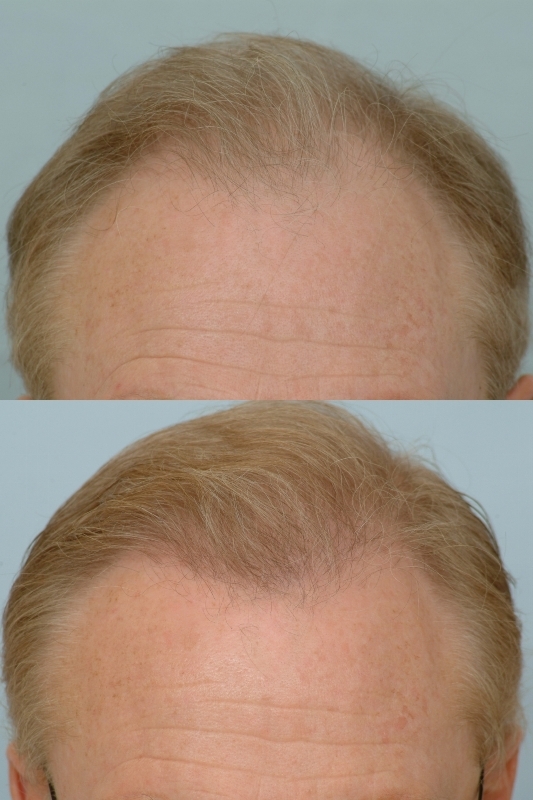 Dr. Cole transplanted approximately 1800 CIT grafts to reconstruct the hair line and add coverage to the temple recessions. The patient has straight blonde hair and a donor density of 250 hairs per square centimeter with 180 being about the average. Straight hair gives less coverage value than curly hair so the demand of the recipient area requires more hairs per square centimeter from the donor. Another notable fact to mention is that this patient had an elevated telogen ratio of scalp hairs. Typically there is no more than 8 to 12% of telogen hairs at one time in a donor area. These hairs are usually lighter in pigment and are less visible under magnification. In CIT, the patients’ donor follicular units are not extracted to be dissected or used more than once in the receded area. The patient had significant improvement at only 6 months post-op as the newly transplanted follicular units began to grow. These transplanted follicular units produce strong hairs that are shades darker and provide more coverage value than the weaker miniaturized follicular units that pre-exist on the frontal scalp. The patient’s face is now framed with a proportioned hairline and temple recessions that give great symmetry to the patient’s facial features. Below are images of the patient’s current progress as the growth from the procedure has fully matured. We are proud to present yet another successfully treated patient who is truly satisfied with the outcome of the case. » recipient area requires more hairs per square centimeter from the donor. » once in the receded area. Thanks. This is a very conservative and mature hairline. 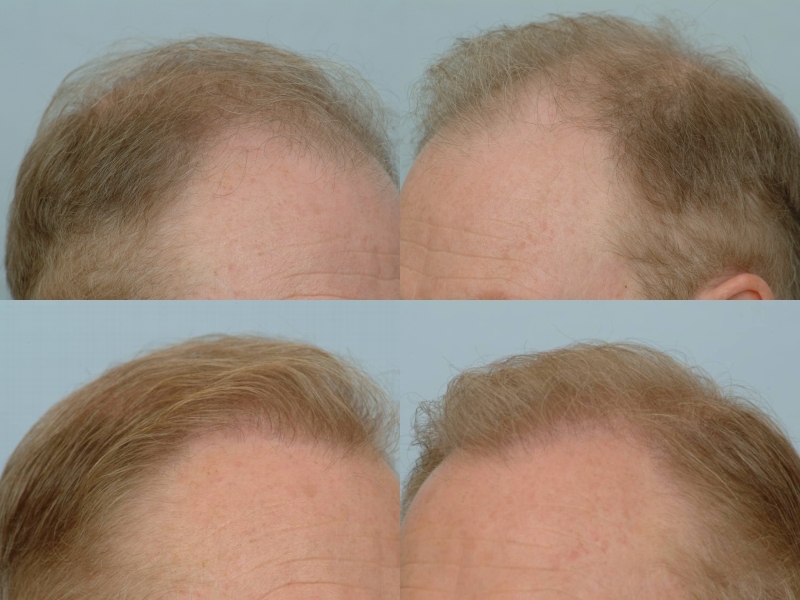 The patient is in his mid 50s and has turned back time with the moderate coverage on the balding scalp. Most patients who come to us understand that hair loss is a progressive condition and nobody is immune to the possibility of future hair loss occurring. We keep our patients’ best interests in mind when we perform CIT.